The past week has been my first in my new home. I have been moving things around, and arranging my favorite things into little vignettes, and happy corners. I've been laying out my art supplies, and organizing my work spaces. This is the first time in my life that I have lived alone, and I am learning how to do that. I am learning what it's like to not take another into consideration when I make a decision about food, what I want to watch, or if I feel like going out. It feels heady, luxurious, and I even feel a strange bit of guilt. Perhaps that’s a Mom thing. I don’t know. One thing I do know : This introspection is long overdue. Mostly it feels good. But it also sometimes feels as if I’m trying to get into clothing that doesn’t quite fit me. It’s pulling at the shoulders, the pants need hemming, and I haven’t quite figured out my personal style. At least I’m protected from the elements. Because I am a multi-discipline artist, this question could be answered in so many ways. However, since I am going through a fairly significant life change right now ( see my previous post) , my mind has been consumed with a lot of deep thoughts about my childhood, and past. Perhaps thats also just a side-effect of hitting menopause, who knows. I certainly seem to have a significant number of friends going through similar self-examination. Anyway, I think I'd like to approach this question of beginnings in terms of when I began to know I was going to be an artist. And the answer to that question is... Always. I have very strong memories of painting rocks, and making little pom-pom creatures with my neighborhood friends. We would set up little tables with all of our creations displayed on them and put up signs to get drivers to pull over and buy our stuff. Pretty much what I'm doing now, but I'm selling online instead. Maybe this summer I'll try standing out in the road with a sign instead. Do you think it would work? This is the yearly instagram challenge from Joanne Hawker to get to know artists and makers. I thought it might also be a good way to jumpstart my daily blog practice. The prompt for the first day was "Favorite to Make". For me, that's a super hard question to answer. I am a painter, illustrator, mixed media artist, and glass artist. I have a LOT of favorite things to make. The easiest answer, I suppose, is that my favorite thing to make, is whatever I am currently working on. Is that too easy a way out? 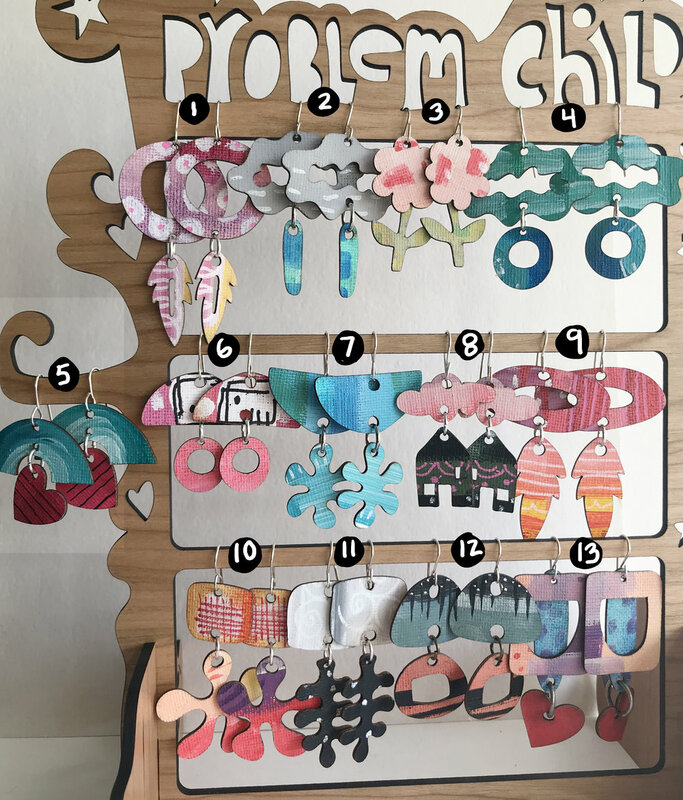 Today, I made Earrings using my 3D Glowforge laser printer; abstract acrylic painting on canvas which is then attached to a cherry wood veneer, and then sent through the laser printer to cut out shapes I designed in illustrator. Then, I put the shapes together into fun lightweight earrings. They are a pleasure to make every step of the way. Is it my favorite thing to make? Today it is. Tomorrow, I'll be spending the morning in my glass studio, at the torch, making beads. Tomorrow, glass beads will be my favorite thing to make. You can find out more about my earring line up there in my site menu. And you can find out more about March Meet The Maker HERE. I suppose the best way to begin is to just blurt it out. My husband and I , after almost 37 years of sharing our lives, have decided to separate. I don’t want to get into the reasons, and drama of our decision here on my blog, but I wanted to let you know about it, so that the future posts here make sense. What I am interested in discussing, are the next steps. The next year will be a time of enormous change for me. I will be feathering a new nest, and sewing together a colorful quilt of a career. Previously, I have been insanely blessed with the freedom of making art in my own time without the stress of having to support a household with my art. I will be taking on some teaching gigs, in drawing, painting, flamework and whatever else I can think of. I am going to ramp up my design business, and my newest project; Problem Child Jewelry. And I will also be doing some craft shows again. My tribe of friends and fellow artists are my lifeline, and are so important to keep me uplifted and inspired daily. It’s going to be an amazing journey. I hope you’ll follow along and share your own stories and adventures. For those who are upset by my news, please know that John and I are still the best of friends, and we still love each other, but we are doing what we feel is the best thing for both of us. There are no sides to take here. Support and Love for both of us is welcome. I’ve been working on more altered photo stuff, and adding to my Imaginary Beastiary menagerie. The first is a new pink gremlin, and the second is an older piece that I decided to rework and refine. 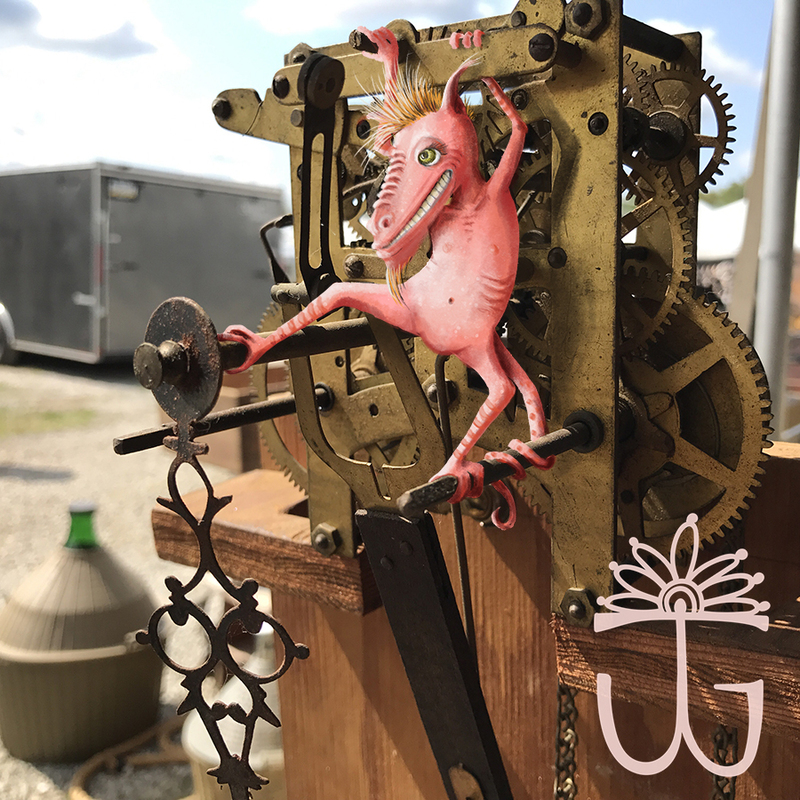 And the gremlin snuck into the clockworks, unscrewed the screws, unseated the gears, and ate the tiny springs to satisfy her desire for disorder. Gleefully giggling in her pink tin voice. This is a portrait of my friend Addie; a whimsical and talented soul. It's also the first portrait I've done experimenting with more imaginary imagery. Fun stuff, and a chance to play with puffy paints and plastic gems, because "Of course I did". I'm not sure why I feel the need to try and make "Serious" work. It's not really my style. Oops! I Found my Voice! I wanted to share how this all went down today, because for me, this morning was a really good example of my process.